Combine the sugar with diced butter. Add the vanilla and process until the mixture just forms a ball. Divide the dough into 2 equal portions. Add the food coloring to one portion and process until just incorporated. If the batter is too sticky you can add more flour. Roll out each portion of dough. You need 2 rectangles ( 1/8 – 1/4 inch thick). Place the turquoise dough on top of the natural one. Beginning on one edge, roll the doughs to make a log so the two colors spiral inside each other. Wrap the log in plastic wrap and refrigerate until firm enough to slice. Preheat oven to 325°F . Slice the log into 1/8 inch (3 mm) thick cookies, and place on prepared baking sheets. Remove from oven, and cool on racks. 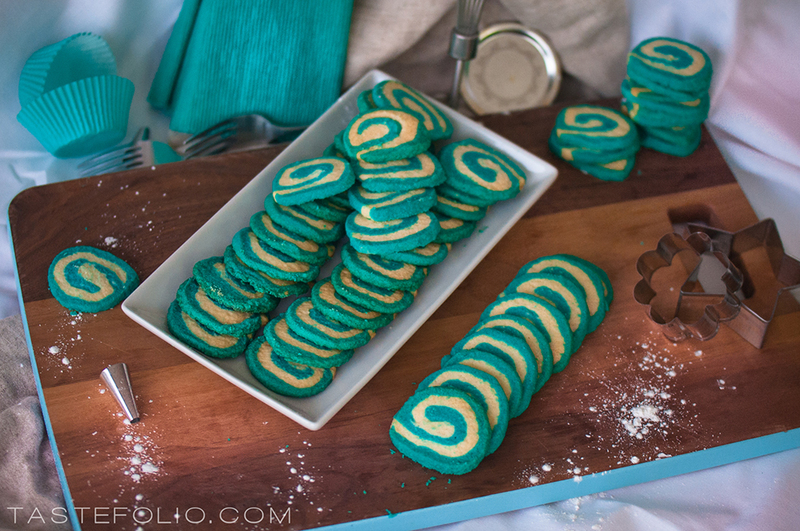 These Pinwheel Cookies are downright irresistible! 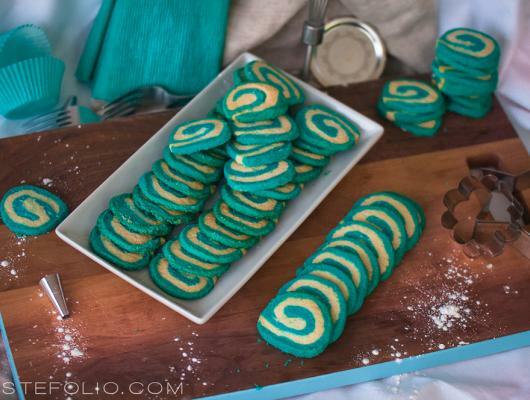 Based on the most delicious sugar cookie dough, these fancy-looking cookies are always a party hit! I brought mine to a New Years Eve Party and everybody loved them! And the best part is that you can store uncut rolls in your freezer to slice and bake as the need arises. They are easy to make and stay fresh for long time!